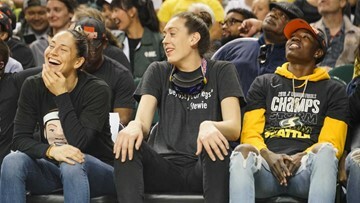 The Seattle Storm picked Ezi Magbegor with the 12th overall pick in the 2019 WNBA Draft. 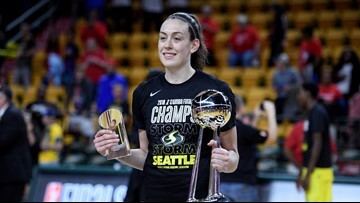 Sales of a Seattle Storm license plate could start October 1 with proceeds going to youth leadership and sports programs. 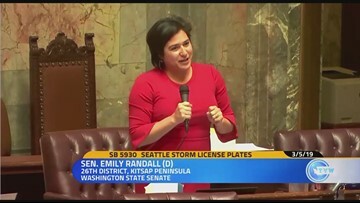 Sen. Emily Randall, D-Bremerton, explains why she’s sponsoring a bill to authorize the sale of Seattle Storm license plates. 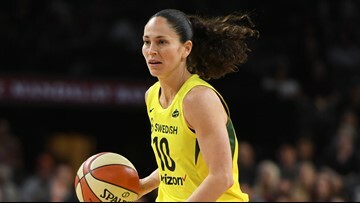 Sue Bird confirmed to thousands of fans over the weekend she plans to return to the Seattle Storm next year for her 17th season with the team. 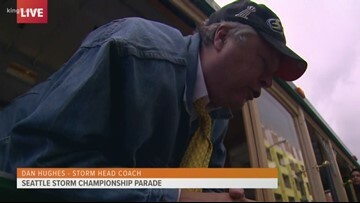 An aerial view of the 2018 Seattle Storm Championship Parade in downtown Seattle. 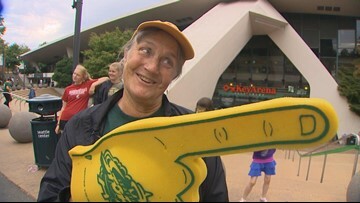 Seattle Storm Head Coach Dan Hughes said "this group of fans reacted before something good happened. 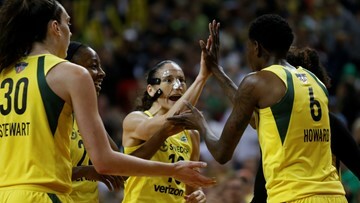 They almost willed this team to greater heights." 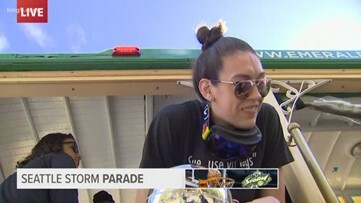 Breanna Stewart spoke with KING 5's Alex Rozier during the Seattle Storm WNBA Championship Parade in downtown Seattle. 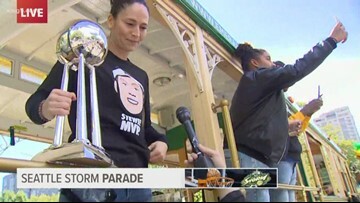 Sue Bird spoke with KING 5's Alex Rozier during the Seattle Storm WNBA Championship Parade in downtown Seattle. 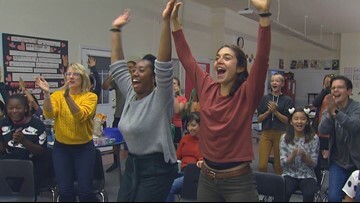 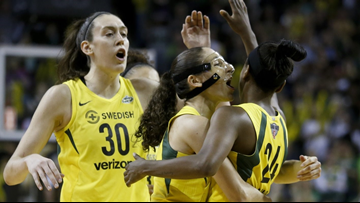 Students don't always want to stay late after school, but there might be an exception if the Seattle Storm is playing for the WNBA Championship. 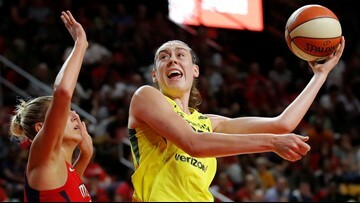 The Seattle Storm claimed the 2018 WNBA title in three games with a 98-82 win over the Washington Mystics. 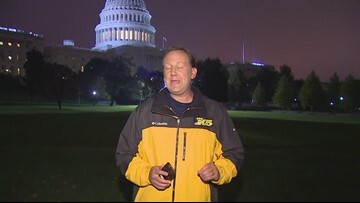 Chris Egan is in Washington, DC with the Storm. 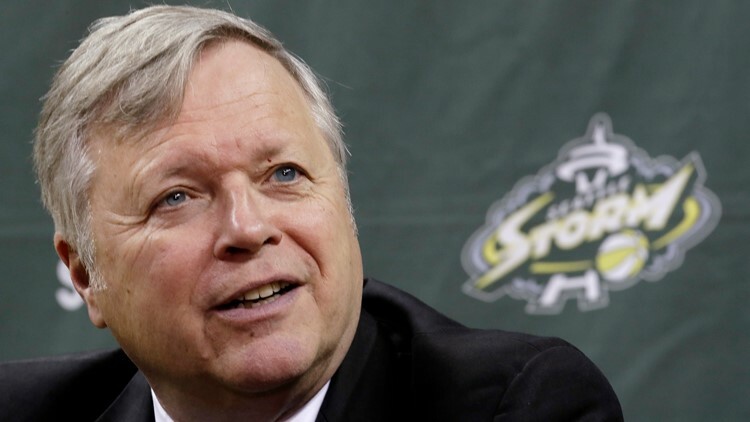 He looks at the Storm's day, and looks ahead to Wednesday's Game 3. 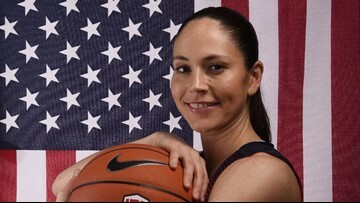 Learn more about basketball superstar Sue Bird as the Storm compete in the WNBA finals. 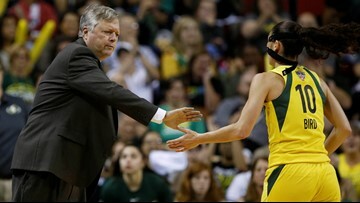 With the Seattle Storm advancing to the WNBA championship, here are five things to know about the national association. 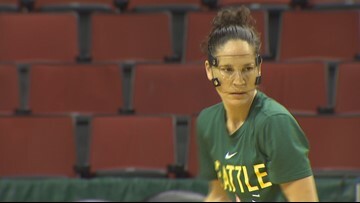 Here's 17 things WNBA star Sue Bird wants you to know before the WNBA Finals.